This new kind of washer offers so many wonderful features, that it’s difficult to arrange them in the proper order for my own consideration. I’ve noted that the machine is a front-loading washer with an added steam-cleaning feature that has bowled over the majority of buyers. 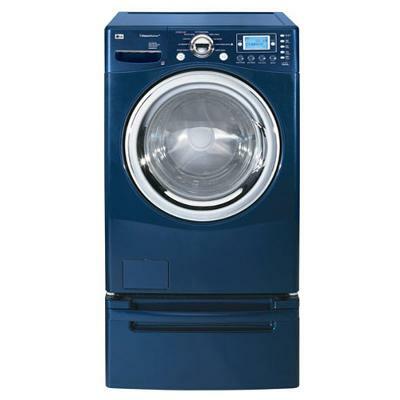 Basically, it has a 4 cu/ ft capacity, with 9 different wash presets, ranging from soaking, wool, hand wash, delicates, and permanent press, not to mention a quick wash setting. The spin cycle goes from 400 - 1320 rpm, and amazingly enough it has 5 speeds! There are also 5 levels of temperature settings, so you’ll never ruin your clothes with only two or three temperature settings. This machine boasts not only dial controls, but also digital display, and has that wonderful delayed start timer so that you can run the machine in the cooler temperatures such as nighttime and such. The drum is stainless steel and not the cheaper porcelain ones found on the lower end machines. It has a “RollerJets” as well as a forced water circulation system. This means that water just won’t easily gush out of a hose “at” the clothes, but water will definitely come “through” the clothing fibers therefore giving you a cleaner wash and rinse! Besides all of these wonderful factors, it has a completely built-in steam system that will allow you to sanitize your clothes. In reading what others thought about the washer, some were inordinately impressed with the fact that the washer itself could automatically adjust its water levels depending on the size of the load. The extra long time selection given for wash delay was startling, as it can be preset for up to 19 hours ahead of time! Mothers were of course impressed with the steam capacity for sanitizing the baby’s clothes, but they also pointed out the fact that the manufacturer/designer was thoughtful enough to add a child lock on the machine. A husband reacted to the fact that there are no pulleys or belts inside and that it is a brushless motor. Someone brought up the control panel’s trilingual ability with the choices of English, French, and Spanish translations! Some of the cons mentioned in regards to this product are that the door must be kept open after use since it is so well sealed that it will produce mold if closed. Someone brought up that the door is not interchangeable for left or right opening. Another problem was cited with the “Steam Fresh” cycle that should be used to remove wrinkles from clean clothes prior to wearing; they said that the clothes came out too damp for wearing. Most mentioned that the unit is pricey. It comes in designer colors not just white, and the features are all useful and not placed for simply for show--they are actually features that most users have desired. The solid construction of the machine should keep this washer going through endless cycles of clothes cleaning. Comments for LG SteamWasher WM2688HNMA - 4.2 cu. Ft. I purchased this very expensive washer and matching dryer, believing that my washing days would be simplified. Far from it ! Having prided myself in having white whites, they are now grey whites. The clothes come out with mildew stains, smell horrid, and the foul odour has permeated my finished laundry room and house. In fact, everything smells ! Trying different HE detergents has not resolved the problem. From the outset, I have dried the gasket, left the door open, and, used Tide Washer cleaner, and, Afresh. Nothing has helped. To add insult to injury, the designated LG repairman has tried to intimidate me, with his remarks about these smells being normal. LG should be ashamed ! Since I purchased an extended warranty, I am trying to have this horrible washer replaced with a top loader. very smelly if you don't leave the door open after using. Too noisy and too much vibration for a main floor laundry room. Shakes the chandeliers in the dining room. it does get the clothes cleaner though. Initially I was quite impressed with this washer although it always had a lot of vibration. Then after 3 years of less than normal use, it became more noisy and increased vibration. The service man who came to look at it informed me that the bearings were worn out, and it would cost more to fix it than replace it. It was 3 months past the extended warranty which I purchased, neither LG or Sears would do anything about it. Would I buy another one of these, not in your life. I am a 55 year old woman and have had many top of the line washers and dryers over the years. I've never had a bad one, but my LG is AWESOME! After buying an LG set for my primary home and loving it so much, within months, I bought a second set for our beach house. They cleans sooo well, that I could actually watch my whites getting whiter over time. Ruth, what are you putting in your machine that would make it smell so bad? Are you doing horse blankets? I've had my LG machines for over two years now, and there is no odor. I run the steam cycle from time to time on my cleaning rags and they come out pristine. All I can guess is that either you are a competitor of LG or you are leaving wet clothes in the washer to mold. If that's the case, they will do than in any machine. Shame on you for trying to trash such a wonder washer! Just sounds like operator error (laziness) to me! Stinky, smelly, sour clothes that were just washed in the horrible LG washer. Never recommend this crappy appliance. How do you get this company to be responsible? I got an extended warranty thru LG that must not be worth the paper it"s written on.LG extended warranty 877-843-3777 they almost never answer, leaves you on hold for over 15 minutes to wear you down.Home Depot acts like they never heard of this problem with LG warranty or the stinky appliance.If you are in Home Depot and see anyone even looking at this stuff tell them to keep walking.We bought an LG washer dryer unit, LG refrigerator and LG dishwasher they are not worth the trouble or money. Unfortunately we paid for these item or they would have been returned. We've tried many recommended remedies and still there is mold. I bought this washer when my husband and I moved into our new house earlier this year. I love it! It works so much better than our old washer did. I have to say, if you don't want to spend 1500 dollars on a washer then this one isn't for you, but I think it was well worth the investment. There are so many features about this washer that I love. This washer has two steam cycles, temperature control (it has its own water heater) and an automatic detergent dispenser. I love the detergent dispenser, its very convenient. The steam cycle is also really nice. I can load about 5 garments into the washer and do a quick steam cycle to get the wrinkles out of the clothes. The less ironing I have to do the better. Another feature I like about this washer is the remote monitoring features it has. I am able to use a computer to monitor my washes, which is really nice since I run a home business via the Internet during the day and I have to chase after two little ones. The LG SteamWasher is also a front load washer, which I really like. I find it much easier to set my laundry basket on the ground and just sort of shovel the clothes into it, rather than having to lift, the sometimes really heavy basket up to drop the clothes into the top of the washer. The tub of the washer is also pretty large which means I can do larger loads, this is nice when you have two kids! My clothes always come out clean and fresh, and the gentle cycle is great for delicates. No clothes of mine have ever gotten ruined from this washer. This washer is also very energy efficient and even has a longer spin cycle, which removes more water so clothes need less time to dry. This saves even more on the energy bill, because my clothes spend less time drying. There are so many things about this washer that I love, and again the only real drawback I'd give for not buying this is the 1500 dollars. The price is a little steep, but in the end I think it was an investment I'll enjoy for years. I bought it from the store located in the sector 8, Gurgoan in January 2008.I have been using this machine for last 9 months and have not faced a single problem with it. It has the best features that a washing machine can have. it offers two steam cycles,one for ironing and other for sanitizing lingering odour. It has a front loading washing phenomena.It has a large capacity stainless steel wash tub and high spin rate which reduces the drying time.It also have a delay time feature. It has been great experience to use this product of LG.I am happy to see my mom happy using this product. My overall experience using this product has been great. According to me it is far superior than the any other product of this range. Machine has taken loads of load off the shoulders of my mom as she need not to waste to much of time in washing of clothes. This machine has eased the task of washing. So i will recommend others that if they want to see there wife's and mom happy then they should surely buy this product and enjoy the benefits and the features of this product.Have this product as soon as u can have it. So, my brother is a freak when it comes to appliances and my Grandparents' washing machine was just about ready for the trash. So my brother decided to go out and buy them a new washing machine just because. Of course, he goes all out and he didn't just get them any ordinary washing machine. He brings home this really awesome looking, blue washing machine by LG. I have never been so fascinated with a washing machine in my life and I wanted to try it asap. So I got some clean and dirty clothes together and I decided to start a load. First of all, it has this cool steam option, which enhances the quality of the wash. Oh, and you load your wash in the front of the washing machine; not at the top, which is just a cool change. You can also use it to get wrinkles out of clothes. I particularly enjoy this feature, because I hate ironing and throwing your pants in the washing machine for fifteen minutes is a lot easier. But the best part is that the LCD display actually keeps you posted on the status of your wash load. It tells you what cycle it's on and how much time you have left to wait, which is pretty cool, because I always seem to throw my wash in at the most inconvenient times - and because I'm usually in a rush, I like knowing how much more time it's going to be before I can throw them in the dryer. I'm almost positive it burned a hole in my brother's pocket, but it's really easy to use and it's pretty too! Oh, and I definitely noticed a difference in the cleanliness of my clothes, compared to the old washing machine.